A female Lyft customer recently filed a lawsuit against the ride-sharing company and one of its drivers, claiming that 61-year-old David Glen McNeill sexually assaulted her and that the company was negligent in dealing with him. In March 2017, McNeill picked the woman up in Orlando. She was partially naked and unconscious in the backseat of McNeill’s SUV when officers found her two hours later. Witnesses said that McNeill was in the backseat of the SUV for about 30 minutes. Police arrested McNeill four months later (after a DNA match) and charged him with sexual battery and giving false information to law enforcement. Police also found pictures of the woman on McNeill’s cell phone. The woman’s lawsuit claims that Lyft was negligent in hiring McNeill, and that the company didn’t properly train or supervise him. She also claims that Lyft made fraudulent misrepresentations to the public about the safety of its passengers. Additionally, she is suing McNeill for intentional infliction of emotional distress. Unfortunately, this isn’t the first time that an Uber or Lyft driver has been accused of sexual harassment or assault. According to CNN, since 2014 at least 103 Uber passengers have accused their drivers of sexually assaulting or abusing them. Is Lyft Vicariously Liable for McNeill’s Actions? There’s a legal principle called respondeat superior that says employers are responsible when their employees act negligently. Respondeat superior is a type of vicarious liability that holds employers responsible even when they weren’t present and didn’t personally cause the injury. The employee was acting within the scope of employment. There are a couple of other legal doctrines that might apply to employer-employee liability. For example, the dangerous instrumentality doctrine says that the owner of an inherently dangerous tool is liable for injuries caused when that tool is operated. The negligent hiring doctrine applies when a company hires an employee it knows or should know has a propensity for committing a harmful act while on the job. And the negligent retention doctrine applies when the employer retains an employee it knows or should know has a propensity for committing harmful acts. You have four years from the date of the injury to file your claim. Also keep in mind that Florida is a comparative fault state, which means that the amount of damages a plaintiff receives is reduced by his or her own percentage of fault. 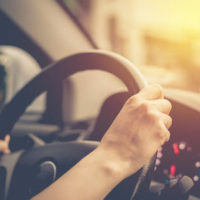 Contact an Orlando personal injury attorney at The Pendas Law Firm today for a free consultation if you are injured in a ride-sharing-related incident, whether it’s a car accident or anything caused by the driver’s negligent or reckless behavior. Both the driver and the company might be liable for your injuries. The Pendas Law Firm also represents clients in the Jacksonville, West Palm Beach, Fort Lauderdale, Fort Myers, Tampa, Miami, Daytona Beach and Bradenton areas.